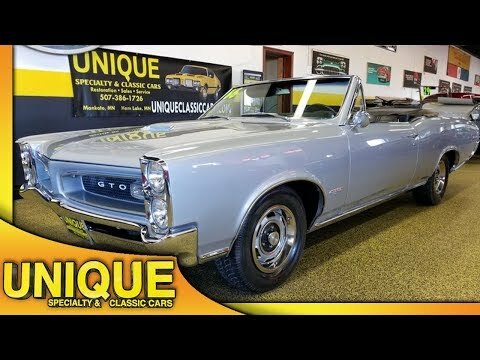 1966 Pontiac GTO Convertible, real 242 Code GTO! TRADES? This 1966 Pontiac GTO Convertible and it is a true GTO. Powered by a 389 under the hood paired with a 4 speed transmission. Power steering, Power Brakes, and A/C equipped on this car. This car is originally a silver car, the top is originally black and still is with matching black interior. Newer repaint in original color, very straight as well. Convertible Top is in great shape. Interior has a little bit of wear to it, but not bad at all. Vinyl bucket seats, carpet and door cards are also in nice shape. Great running and driving GTO. Engine Code WT which decodes to a 389-335HP with manual transmission.